As its subtitle “The Seafaring Mountain Bandits” suggests, period adventure flick “The Pirates” is out to make audiences laugh. Though the film that opened on Aug. 6 faces strong competition from another period movie, “Roaring Currents,” it has taken off in its own way, offering fun and laughter. Just as Lee hoped, the film is quite fun. It kicks off with the foolhardy mission to find a whale that swallowed a royal seal. The story is fact blended with fiction. Inspired by the historical fact that a royal seal did actually go missing early in the Joseon era (1392-1910) for some period of time, the movie fuses history and imagination hilariously as it recounts the search for the artifact. As the royal seal ensures a new royal family’s legitimacy, various groups are willing to do anything to possess valuables and rush to sea to find the seal first. The motley crew sets out on its search on a pirate ship. 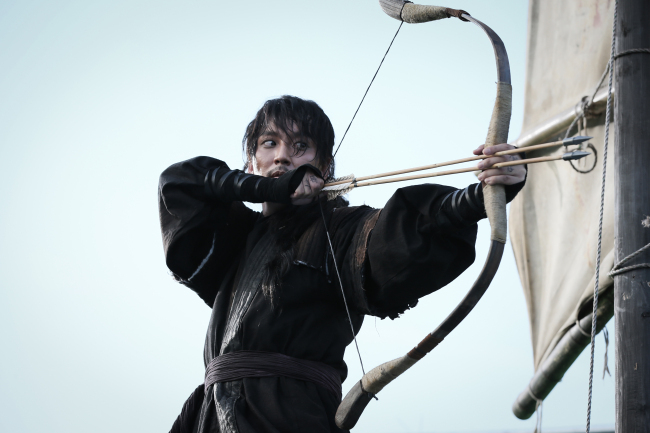 Jang Sa-jung, played by actor Kim Nam-gil, heads a group of bandits who leave the mountains for the ocean for the very first time, while Yeo-wol, played by actress Son Ye-jin, leads a group of pirates. While Yeo-wol’s pirates are serious and true robbers on the sea, Jang’s bandits are bungling novices who commit one ludicrous blunder after another due to their ignorance about the ocean. Government officials and other bands of pirates also join the furious and messy hunt for the whale. “The Pirates,” dubbed the Korean answer to “Pirates of the Caribbean,” is the first Korean film themed around sea bandits. Unique and quirky characters, incessant Dumb and Dumber-like incidents, and the struggle to attain the same goal all smell of the Hollywood blockbuster. However, the film differs from the “Pirates of the Caribbean” with the historical setting sprinkled with Korean-style humor and slapstick comedy. Yoo Hae-jin’s hilarious acting is noteworthy. He is a pirate-turned-mountain bandit since he gets seasick all the time and can’t stand the smell of fish. His nice mix of down-to-earth acting and nonchalant gestures makes him the perfect mood-maker. Actor Kim Nam-gil’s changeup from his erstwhile serious and weighty roles to a light and witty character seems to be a comfortable move for him, as he said the role of Jang fits his own personality. As the humorous and optimistic, but also chivalrous and loyal leader of the bandits, Kim manages to deliver his familiar charm to the audience. Son Ye-jin in her first action role, which deviates from her entrenched image as the queen of romantic comedy, took on the character of a spirited heroine well. She and Kim work in a perfect harmony as the leads in the film, as it is their second time to film together as a couple. If viewers expect life lessons from the film, they’ll see little to none outside the lines, “Let’s protect the animal,” or “Live each moment fully.” But the film is most definitely entertaining, offering a good laugh to cool off a bit in summer heat.